At the end of the game, there sat Stingers forward Olivier Hinse, still on the bench, remembering his four years with the team—his four years of experiences, of calling the Ed Meagher Arena his home, and calling the Stingers his family. There he was, moments after the final whistle, having faced the reality that he had just played his last game with the Maroon and Gold. 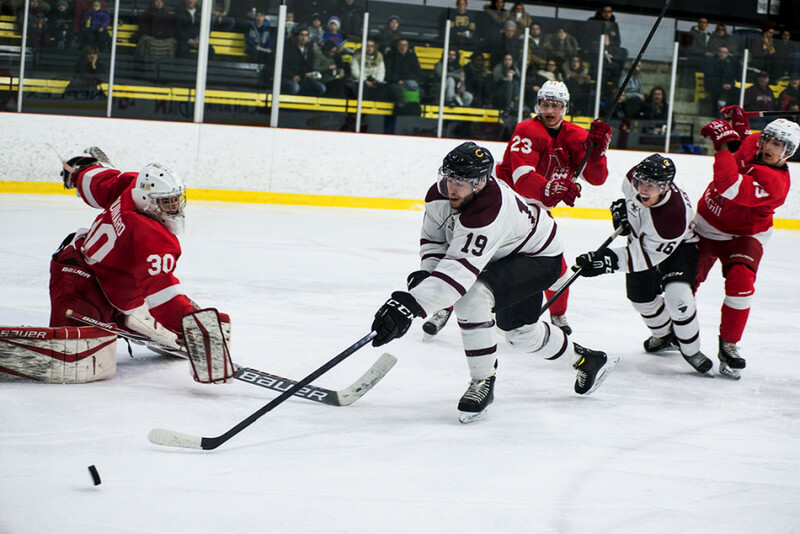 It was game two of the Ontario University Athletics playoffs, and Concordia was coming off of a 9-2 defeat at the hands of the McGill Redmen last Wednesday. On Friday night, Hinse and his squad wanted to win to force a game three on Sunday, but it didn’t happen. The Redmen battled into overtime and won 4-3. When Hinse joined the Stingers four years ago, there wasn’t much time before he was the face of the team. 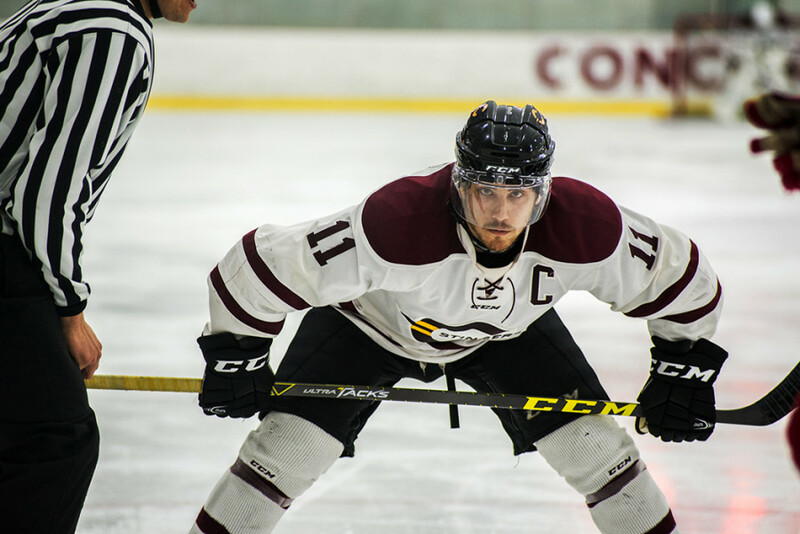 In his second year he was named assistant captain and then captain in his third year. Friday night’s game sparked a fire under the Stingers as they had great opportunities to score early on. Near the end of the first, Concordia forward Scott Oke scored first. Soon after, however, the Stingers found themselves in penalty trouble as Philippe Hudon would get a five minute major penalty and a game misconduct for a hit to the head, shortening the Stingers bench and removing one of their top players. 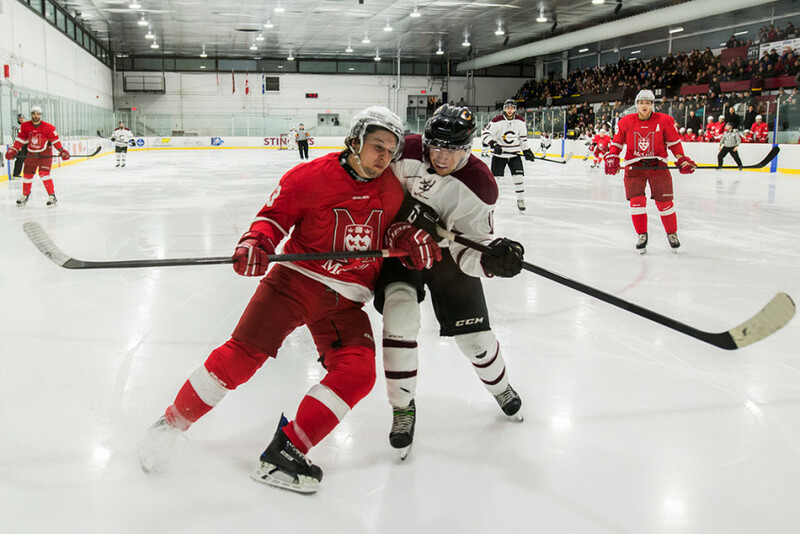 McGill forward David Rose then tied the game at 1-1. Concordia regained their lead in the second period, but Rose tied the game up once again. With under ten minutes, Hinse scored to give his team a lead going into the third period. But McGill wouldn’t quit. Simon Tardif-Richard tied the game in the third period, before scoring the game-winning goal on the power play in overtime. Stingers goaltender Miguel Sullivan saved 47 of 51 shots on the night, doing his best to keep his team in the game. Element also opted to start Sullivan again after allowing seven goals in the previous game, over his veteran goaltender Robin Billingham. “[Sullivan] played really well. He really had a good game and if you want to have to success you need your goalie to play a game like that,” said Element. The overtime period was not without controversy when there was no penalty called when a Stinger hit Redmen defender Dominic Talbot-Tassi from behind. He stayed down on the ice for an extended period of time before being escorted off the ice by team doctors. Element said he would have to rewatch the video before commenting on the hits. 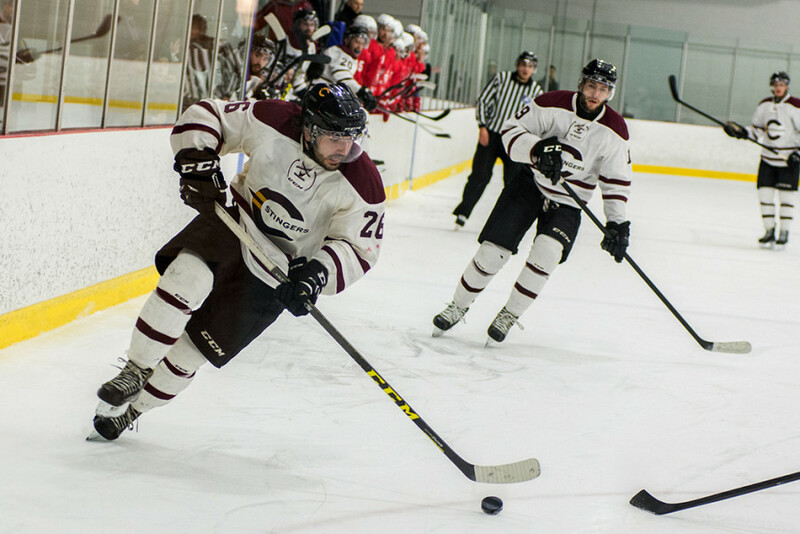 With the period winding down, Stingers forward Anthony Cortese took a hooking penalty, and McGill scored on the ensuing power play to end the game and sweep the series. Hinse’s university career wasn’t the only one to end following the Redmen’s game-winning goal. 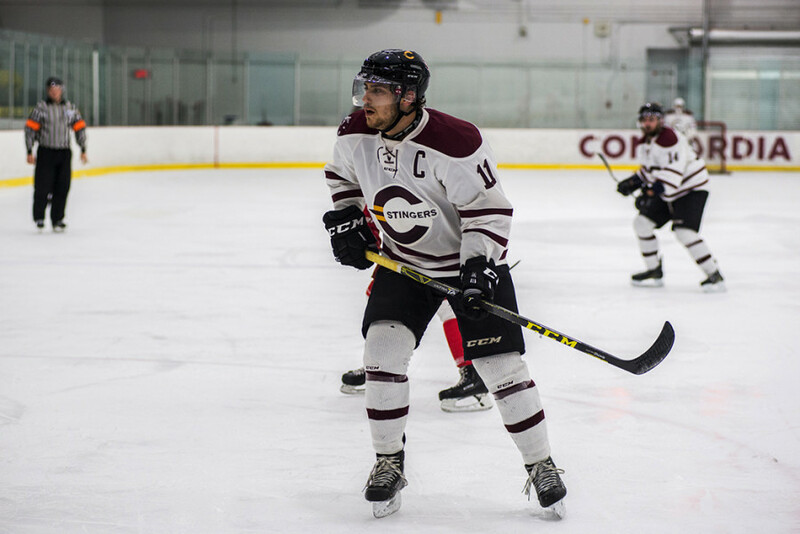 Fellow Stingers teammate and assistant captain Jessyko Bernard is also leaving the team. Both players have been with the team for four years. 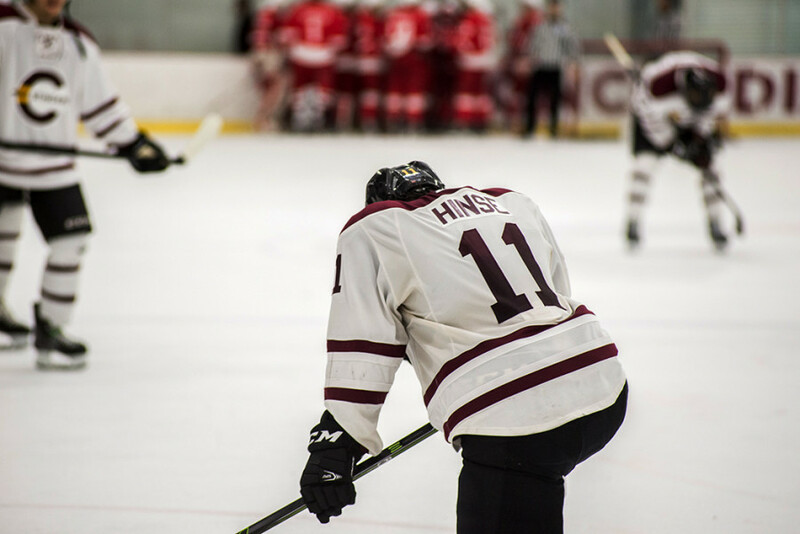 Hinse, who is majoring in Child Studies, has hinted a future of playing pro hockey. Although he declined to comment on where it might be. Head coach Marc-Andre Element also faces some uncertainty as he may have coached his last game with the Stingers. Concordia is currently going through the process of hiring a new coach, and while Element has applied for the position, there has been no news about who will be behind the bench next season. The future of the team may consist of many first-year players. Therefore, optimism around the locker is high in the hopes that the Stingers can improve. The team has already added recruits for next year, notably defenseman Philippe Bureau-Blais and goaltender Maxime Clermont. Bureau-Blais has played in the Quebec Major Junior Hockey League for last two seasons, and Clermont has played in the East Coast Hockey League. “Look out for next year because these guys are amazing. They’re a great bunch of young players, they have big hearts, and they never stop working,” said Hinse. “There’s a change of culture going on and we’re all going in the right direction.